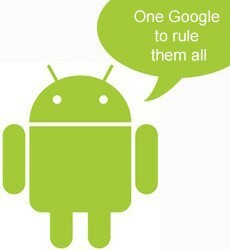 Google tightening control of Android, insisting licensees abide by 'non-fragmentation clauses'? A storm seems to be brewing over the realm of Android development. Bloomberg's Businessweek spies have received word from "a dozen executives working at key companies in the Android ecosystem" that Google is actively working to gain control and final say over customizations of its popular mobile OS. That might not sound unreasonable, and indeed Google's public position on the matter is that it's seeking to stabilize the platform and ensure quality control, but it does mark a major shift from where Android started -- an open source OS that was also open to manufacturers and carriers to customize as they wish. Not so anymore, we're told, as apparently Mountain View is now demanding that content partnerships and OS tweaks get the blessing of Andy Rubin before proceeding. The alternative, of course, is to not be inside Google's warm and fuzzy early access program, but then, as evidenced by the company recently withholding the Honeycomb source code, you end up far behind those among your competitors who do dance to Google's pipe. "The premise of a true open software platform may be where Android started, but it's not where Android is going."